Imagine you were suddenly launched back in time and onto the deck of a naval ship in the second half of the 19th century. What’s the very first thing you’d do? Personally, if I’ve learnt anything about time travel from The Terminator, I’d find some clothes. 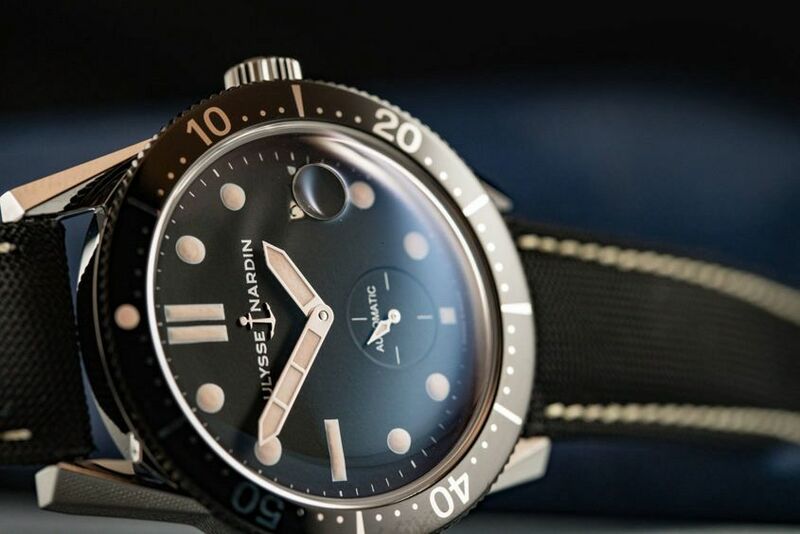 Shortly after that, I’d be pretty keen to know exactly “when” I was, and the only way to do that at sea would be to consult the ship’s marine chronometre – and there’s a good chance it would been made by Ulysse Nardin. It’s this style of watch – along with other suitably nautical horology that made UN famous – that they’re still best known for today. But that doesn’t mean they don’t surprise us every so often. 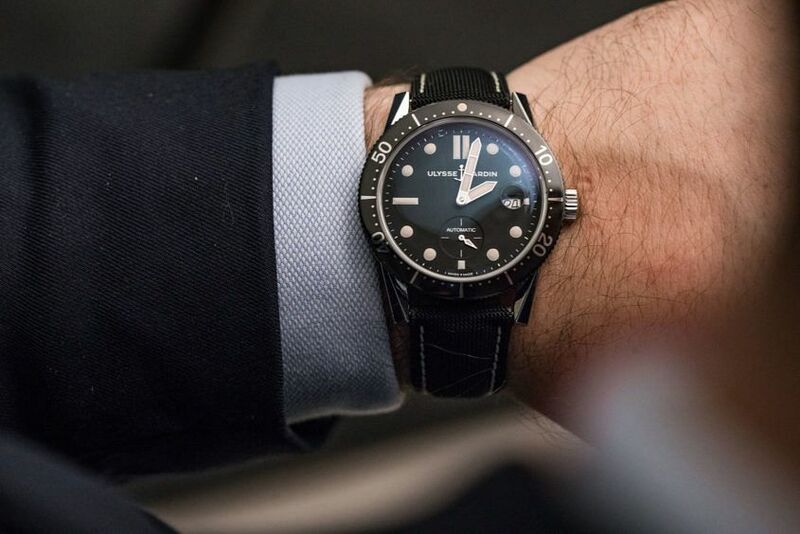 And this year they dipped into their 171-year-old back catalogue and released a vintage inspired reissue of a 1964 diver, called, simply enough, the Diver Le Locle. As far as looks go, not much has changed from the original. The design elements that made the original such a looker are still present – large luminescent hour markers, thick pencil hands, and a fully graduated unidirectional coin edged bezel. Although, they’ve been updated to suit modern standards. Take the highly-polished steel case, for example. It’s now a contemporary 42.2mm, but the distinct, long and heavily bevelled lugs remain. And don’t forget that lovely domed sapphire. Surprisingly though, water resistance has been halved to 100m from the original’s 200m WR, but let’s be honest, for most of us less-than-extreme divers, that’s more than adequate. On the flip side is an excellent solid case back, engraved with a spear holding diver who’s being circled by three rather menacing looking hammerhead sharks. 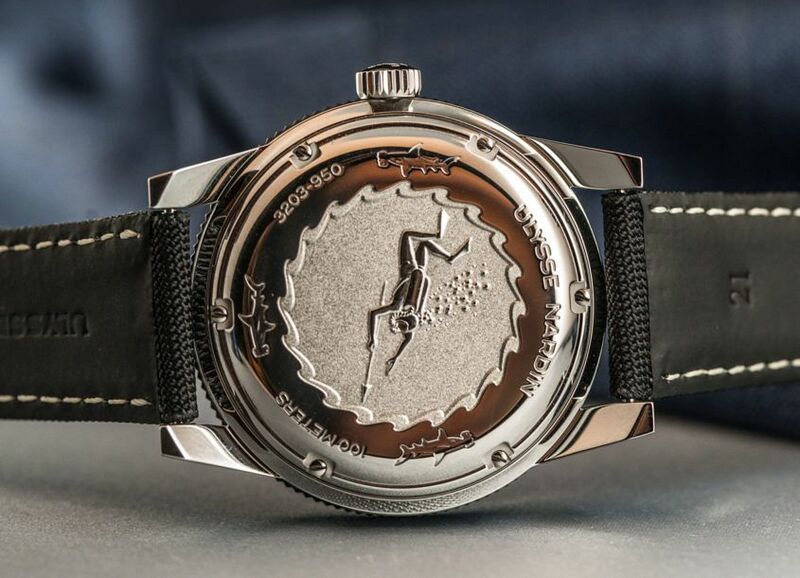 After all, who doesn’t love a dramatic caseback? The real point of difference – and what sets the Diver Le Locle apart in an extremely competitive market – is within the case. The watch is powered by the Caliber UN-320, a manufacture movement with silicon escapement and hairspring, meaning it’s not just resistant to magnetism, but virtually immune. 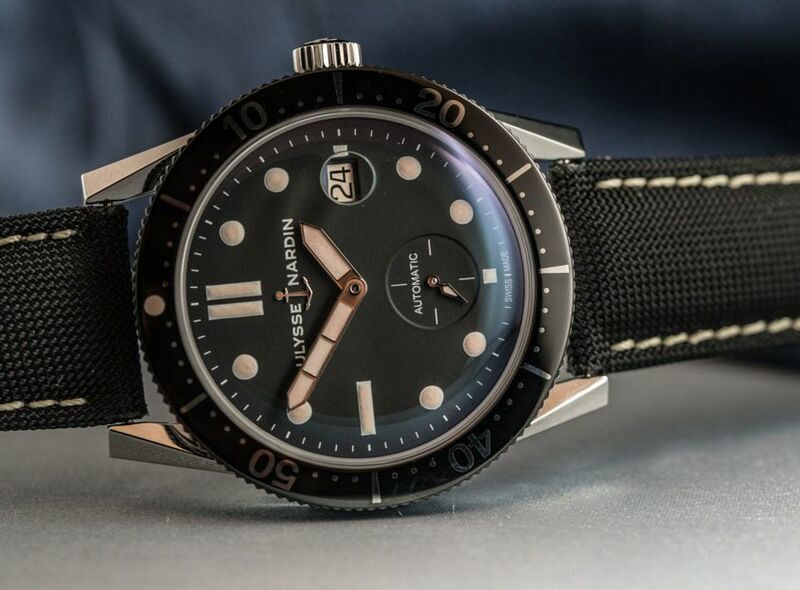 Each movement undergoes a stringent internal certification process, and with a 48-hour power reserve, small seconds display at 6 o’clock, and magnified date at three – which is able to be quickset both forwards and backwards – it’s what beats on the inside that not only brings the Diver Le Locle up to date but also celebrates UN’s innovative history. 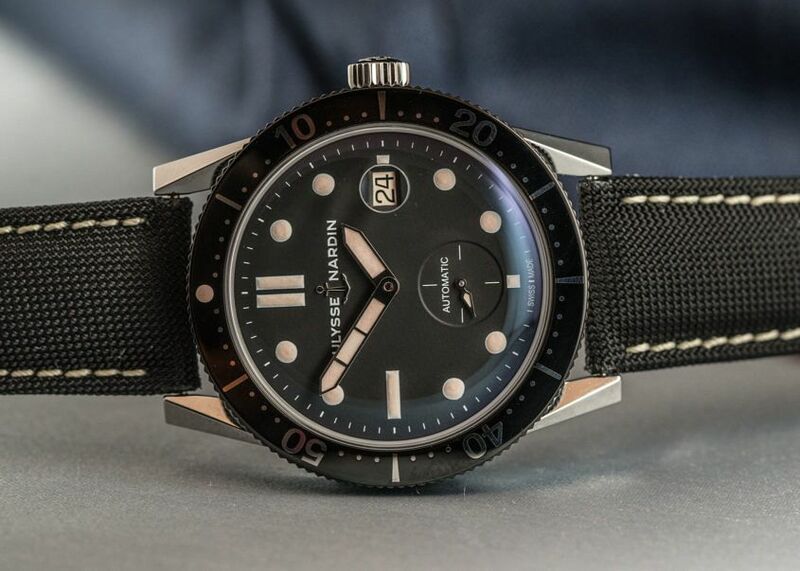 Available on a durable 21mm sailcloth strap, the Diver Le Locle is a solid, handsome choice amongst some very stiff competition. While it’s not unusual for a brand to release a vintage inspired dive watch, when that brand is one as storied as Ulysse Nardin, it’s sure to make a splash.